The Gunners need a miracle tonight after a thumping first-leg loss at the Allianz Arena. ARSENAL FANS HAVE gathered outside the Emirates Stadium ahead of tonight’s Champions League Round of 16 second-leg clash with Bayern Munich to protest against boss Arsene Wenger. Some carried flags and banners pleading with the top brass not to offer the under-fire Frenchman a new deal while they also joined in a chorus of ‘We want Wenger out’ and ‘You’re killing our club’. Those present estimated that there was a couple of hundred fans taking part in the demonstrations. Arsenal fans protest outside the Emirates ahead of their game vs. Bayern Munich this evening. The chants weren’t only directed at Wenger, though. The Arsenal board also received a fair share of criticism with the club’s Chief Executive the subject of some abuse. Arsenal were thumped 5-1 in the first-leg at the Allianz Arena, the performance and result sparking an inevitable reaction from the fanbase. 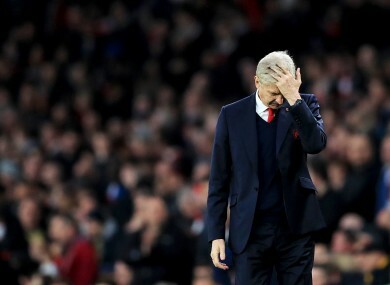 From their last six games in all competitions, Arsenal have lost four and, in recent days, they’ve had to deal with a training-ground controversy involving Alexis Sanchez, rumours surrounding his and Mesut Oil’s future as well as the general malaise that has engulfed the club. It’s been reported that Wenger has been offered a two-year extension to his current deal but will decide at the end of the season whether he’ll remain. Do you agree with Frank Lampard’s Premier League team of the season? Email “'We want Wenger out': Arsenal fans protest outside the Emirates ahead of Bayern clash”. Feedback on “'We want Wenger out': Arsenal fans protest outside the Emirates ahead of Bayern clash”.